*Additional pharmacy expenses may apply if selected by client. *Laboratory expenses are the responsibility of the client. *This statement is based on a side-by-side analysis of all delivery methods comparing cost, delivery method, variability of serum levels, tolerance, down stream by-products, difficulty of use, expulsion rate, infection rate, and ability to adjust or withdrawal therapy if necessary. *Call to discuss the details of this elite concierge service. To schedule a consultation simply call 937.350.5527 and one of our team members will assist you. Please complete all AMMI questionnaires, ordered laboratory and obtain any necessary old medical records before you arrive for your initial consultation. This will allow Dr. Rob and his staff time to compile your biomarkers effectively and efficiently. You will receive an email after you make a consultation appointment that contains a link to our online patient forms. You can then download all of the intake forms, Elite Lifestyle Questionnaire and Nutritional Questionnaire. http://www.alphamaleinstitute.com/patient-forms/ Upon completion of your consultation, you will receive a copy of all your biomarkers, relevant data and recommendations on a flash drive. Should you need additional copies of your medical records, a $30 administrative fee will be charged for copies, handling, and postage. We require a credit card number at the time of scheduling your consultation. Our administrative team immediately begins creating your portfolio to gather your administrative data and biomarkers. We are already working behind the scene in preparation of your upcoming consultation. This credit card will be used to hold your appointment and will be kept on file and will be used to complete payment for services, unless otherwise specified by you at the time of check out. We accept cash, checks, Visa, MasterCard, Discover, and American Express. We do not accept insurance. We will provide you with an itemized bill that you can file with your insurance company. Patients who have out-of-network benefits may or may not be reimbursed. Our office cannot assist you with claim resolution. You may be able to use pre-tax dollars from a Health Savings Account (HSA) or a Flexible Spending Account (FSA) to pay for your fees related to your services from this office. The Alpha Male Medical Institute nor Dr. Rob nor any of his employees or affiliates is responsible for payment differences or amounts set by your insurance company. Payment amounts vary per insurance provider depending on your agreement with them and this office is not responsible for dictating or making you aware of the terms and agreements between your insurance company and yourself. Please contact your insurance company with any questions or concerns regarding covered amounts and deductibles. All of our services must be paid for at the time the services are delivered. Dr. Rob does not fill out medical disability forms for patients, and does not submit medical records to support disability claims. Your consultation must be cancelled or rescheduled at least 72 hours (3 business days) prior to your consultation time, or you will be charged $100.00 US for the visit. You may cancel your appointment by calling the office at 937-350-5527 or by email at support@AlphaMaleInstitute.com We currently have a waiting list for consultations and many of our clients are travelling from considerable distances. We ask that if you know that you need to cancel or reschedule, please let us know as soon as possible so that we may offer your consultation time to someone on the current waiting list. In case of a serious medical emergency, call 911 or go directly to the nearest emergency room. Dr. Rob serves as a medical consultant. Unless we have accepted you as a primary care concierge patient by application and contractual arrangement, we require you have a primary care physician for your urgent care and problems that arise when Dr. Rob is not available. Our staff is available to take your message about your health Monday through Friday 10am-4pm. We are not available outside of these hours. Please allow up to 72 business hours for a return call. In many instances, we may be able to get back to you sooner than that. Another excellent way to contact the AMMI Team is by emailing us at support@AlphaMaleInstitute.com If you are a concierge patient then you have Dr. Rob's private cell phone number and Team numbers and can feel free to contact him or any of the team members directly. We have access to laboratories nationwide to accommodate your needs, whether you live locally or out of state. Some of the specialty labs that we recommend involve blood, stool, urine, or saliva samples and can be done by you in your home. You will be given all lab kits and step-by-step instructions for at-home tests at the time of your consult. Once all of the final lab results are received, we will review them with you at your visit. When we request laboratory tests, it is essential that they be performed promptly. Many tests can take up to 4 weeks to perform and for the results to be returned to us. Please do not delay in completing your tests. Some of the specialized tests may not be considered medically necessary by your insurance carrier, and therefore might not be covered. It is your responsibility to make a follow-up appointment to review your lab results with Dr. Rob. If you are unable to return to our office to review your labs, we are available by Skype, Face time, or telephone. We do not accept returns of supplements or specialty labs. Specialty lab kits must be used within 3 months. 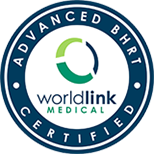 Nutritional therapy and laboratory/diagnostic testing are integral components of your treatment plan. Test results are used to design your personal health care program as well as uncover the root causes of your medical condition. Nutritional supplements are often recommended and we will help you select and find the highest quality products. The supplements that we recommend at the Alpha Male Medical Institute are available for purchase in our office or through the storefront on our website. 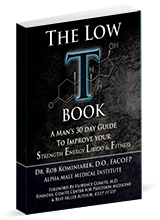 http://www.alphamaleinstitute.com/the-alpha-male-store/ It is possible to have your supplements automatically shipped to your home or office for your convenience. Refills are granted at the time of your consultation or follow up appointments. When you are running low on your medication, it is a REMINDER that you are probably due for your follow up appointment. I generally prescribe enough medication to last until your next follow up appointment. Supplements are immediately available to you by calling the office, visiting the office, or by ordering directly from the websites.